For composers of the 18th century the good reception of publications of their music was a kind of mixed blessing. Unscrupulous publishers were only too keen to milk the success of such editions and often printed further collections of music under the name of a popular composer without his consent. Often they didn't even bother to include concertos from someone else's pen. Antonio Vivaldi knew all about this. The Amsterdam music printer Estienne Roger published two collections of twelve concertos each: L'Estro Armonico op. 3 in 1711 and La stravaganza op. 4 in 1716. Each was a considerable success and this inspired the publisher to print three further collections. In 1716 a set of six sonatas came from the press (op. 5), followed by six concertos as op. 6 (1719) and a set of twelve concertos, published as Vivaldi's op. 7 in 1720. It is very unlikely that Vivaldi had anything to do with the publication of the latter collection. It seems that it was Estienne Roger himself - with his daughter who would take over the business after his death - who was responsible for putting it together. The set is divided into two books, each with six concertos and each opening with a concerto for oboe, strings and bc. The other concertos were for violin. At first the two oboe concertos were included in Peter Ryom's catalogue of Vivaldi's works but recent research has resulted in them being labelled as definitely inauthentic. As a result they have been removed to the appendix. The Dutch musicologist Rudolf Rasch who meticulously studied this collection believes that at least half of the concertos in this set are of dubious authenticity. It is notable that three of the violin concertos have an additional a to their catalogue number which indicates that they exist in different versions. Vivaldi lovers may immediately recognize the Concerto in D (RV 208a) which opens the first disc. It is better known under the nickname of Il grosso Mogul; it was also arranged for organ solo by Johann Sebastian Bach. The version from op. 7 differs in that it omits the cadenzas from the two fast movements whereas this version also has a completely different slow movement in the centre. This could well be an early version which was later reworked as the concerto as we know it and which has achieved considerable popularity in our own time. It is also an indication that concertos which were meant for publication were usually less virtuosic than those which the composer wrote for his own use. That said, some concertos are certainly anything but easy, such as the last from this set, the Concerto in D (RV 214) which includes some double-stopping. The Concerto in F (RV 294a) differs from RV 294 in that is has a different slow movement. This version also includes two parts for oboes but these are considered inauthentic and have been omitted from this recording. In the case of the Concerto in F (RV 285a) it is the first movement which differs from that of RV 285. One could speculate about how these different versions have come into existence. Did Vivaldi replace some movements later or are these different versions the result of the publisher's activities? If the latter is the case he may just have put together what circulated in manuscript and such copies may not always have been complete. The oboe concertos were recorded by the same artists before and included in the set with Vivaldi's complete oboe concertos (review). If the dates of the recording in the booklet of the present disc are correct they have recorded them again. It is understandable that they wanted to include them here in the interest of completeness. However, without them one disc may have sufficed for the remaining concertos. Whether they are authentic or not, it is nice to have them on disc. It is probably the authenticity issue which explains why they have fared pretty badly on disc. ArkivMusic lists just one complete recording on modern instruments and not a single one on period instruments; the present release was not yet included at the time of writing this review. Therefore we may assume that this is the first complete recording with period instruments. It makes up for the omission with technically impressive and musically engaging performances by Federico Guglielmo and L'Arte dell'Arco. Guglielmo plays a precious instrument of 1760 from which he draws a beautiful sound. The vividness and the virtuosic elements in the fast movements are not lost on him and there is plenty of expression in the slow movements. 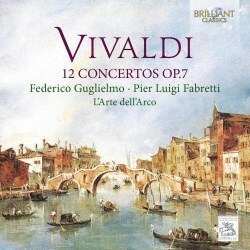 This is an excellent opportunity to fill a gap in your Vivaldi collection.